Keenan has long been recognised for its impressive range of horizontal mixer wagons, most notably the popular rotating paddle-based MechFiber machines. So it was something of an unexpected surprise to see a Keenan twin-auger vertical mixer taking centre stage at the Keenan site at New Zealand Agricultural Fieldays®. The first shipment to arrive in New Zealand is already hard at work around the country, and to see the new vertical mixer in action, I visited Pam and John Hunter from Eureka, Waikato. The couple is heading into their second season on their new farm and, as part of the growth, have been increasing cow numbers. They decided they needed a new mixer to cope with the extra capacity required to feed the stock. Top of the priority list was a machine capable of feeding the 400 plus herd of cows in one mix per day to provide savings in wear and tear on machinery and infrastructure. Just as important was the time-savings created for Pam, John, and their staff. is a big commitment and needs to be done as efficiently and sustainably as possible for the ongoing success of their business. With a large covered concrete feed pad in place already, upgrading the feed bunker area has been a focus. Two new maize bunkers and three smaller bunkers for palm kernel and other feeds have been built and a steel shipping container placed alongside to store minerals out of the weather. With plenty of room for truck and trailer units to turn around, Pam says truckies have noticed and appreciated the upgrades. 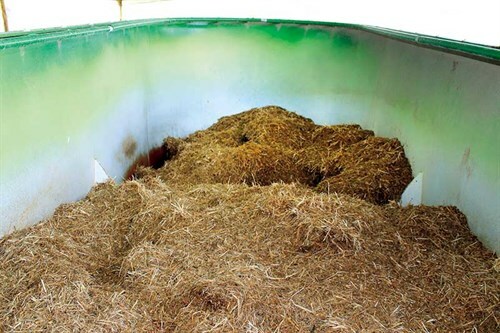 A new retractable cover for the likes of the PKE bin has yet to be installed to help minimise wastage and ensure consistency for feeds offered to animals. 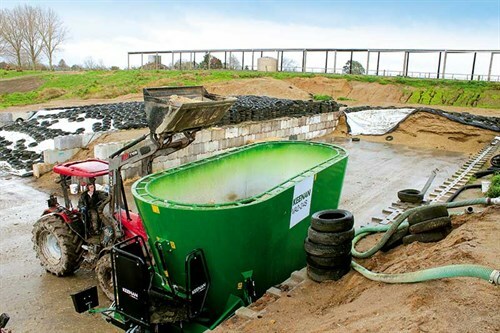 The wastewater sump catches runoff so it can be spread on paddocks, and finishes off the fantastic setup. After extensive research, which involved reading up on different machines and physical demonstrations on farm, Pam and John decided on the new Keenan VA2-24S, which they purchased at Fieldays and had delivered straight after. As the model name suggests, the VA2-24S is a twin vertical auger tub mixer, which can handle mixes up to 24 cubic meters. The ‘S’ stands for short. It’s compact in length, offering a little bit more manoeuvrability around the feedpad. The loading height of 3.3 metres is right at the limit for a 100hp loader tractor. 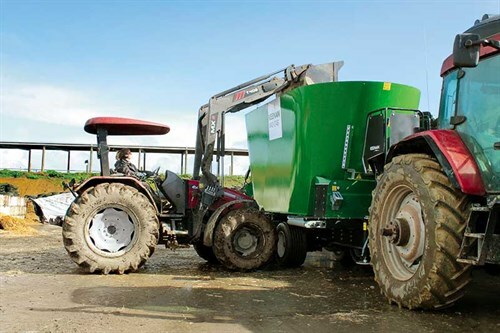 There’s also a longer wheelbase model option, which is 350mm lower, making it easier for loading but longer when manoeuvring around the feedpad. So it’s all a matter of choosing what works best in the specific situation suited to your property. 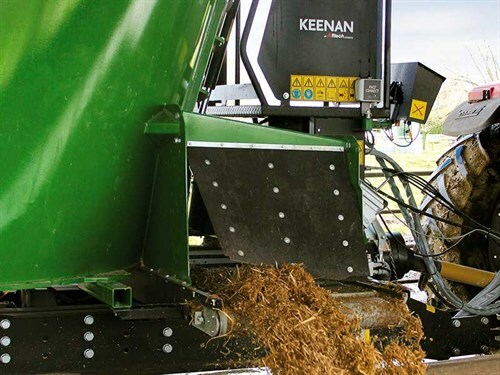 With the addition of the vertical feeder options, Keenan now offers a machine to suit pretty much every application imaginable. I wouldn’t consider the operation of a mixer wagon to be rocket science. Keenan, however, has developed plenty of science around creating a consistent mix to achieve optimal rumen health (in cattle), results, and production. The science and calculations had been developed for the Keenan paddle mixers, and all of this research and experience has been adapted to create the ultimate vertical mixer. Following the correct loading order and allowing the correct mixing times, similar and consistent results can be replicated. Pam and John are happy with the mix being produced and fed out to the cows from their new vertical auger mixer. The Keenan In Touch control box allows them to load multiple different mixes. Throughout calving, they had three different mixes: for dry’s, colostrum’s, and milkers. Each of these is made up of different quantities of maize, PKE, soya, water, straw, and minerals. With the mixer wagon, you have the option to feed whatever you like. For example, in the Bay of Plenty, reject, squash and kiwi fruit can be a good option. If you want to vary diets, just ring the call centre and adjustments can be made. When I visited, John and Pam had their new mixer for just over a month, so were still coming to terms with the capabilities the upgrade in technology offered over the basic weighing of inputs of their old unit. Of particular benefit is the remote that allows you to move on to the next mix ingredient if you are within 510kg, a feature Pam finds most helpful. To feed out the final bit, switching the PTO gearbox on the tractor sees the mixer spin off the last of the feed to be fed out. Mixing is done with the PTO in 540, decreasing the horsepower required for operation. With an older Case MX150 as the donkey providing the power, and with only a slight hill between the bunker and feed pad, the 16-tonne fully loaded mixer shouldn’t be an issue. Removing rear linkage arms for mixer wagon tractors also helps with manoeuvrability around tight feed pads. One thing Pam and John would have liked included on their new wagon is the magnets found on the MechFibre Keenan wagons, knowing what they have caught with those in the past and having saved a number of cows from eating things they shouldn’t. which wouldn’t be 100% as effective but better than nothing. As you would expect of any company selling equipment in the international market, I couldn’t fault the build quality of the Keenan vertical mixer. Weighing in at 7.7 tonnes empty, the Storti/Keenan policy of building things to last is obvious; chassis and components are heavy-duty. The solid single-piece tub provides plenty of strength with a bolted tube steel ring around the top inside, preventing flex when mixing or damage when loading. The paint job is excellent, although Pam and John found that after a bit of wear removed some paint from the inside of the tub, the consistency of mix further improved. They got Jon Kimber at Keenan New Zealand to buff the paint off the augers also. 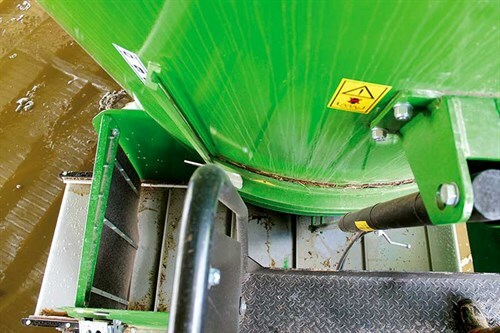 With a feed door at the front feeding onto a conveyor, it’s easy to see what you’re doing while feeding out. The feed door has a large scale up the right side to show how far the door is open. It’s also available with an extra elevator arm to help feed into high bins. Pam and John’s situation didn’t require this, so Jon moved the feed elevator over a little bit to the right, allowing them to feed directly into their feed troughs while driving a little further away. 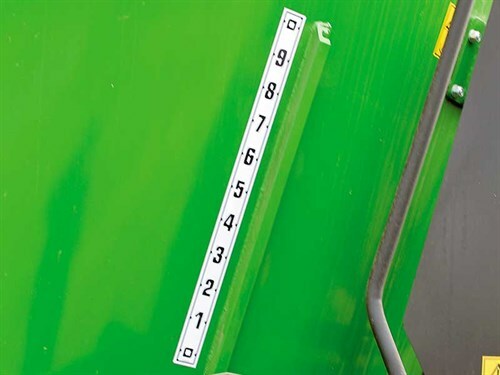 This further decreases the chance of catching the machine or of the tractor causing any damage. If you didn’t know otherwise, the modification would go unnoticed. The other minor tweak Jon made for Pam and John was to flip the drawbar hitch (different tractors have different drawbar heights). Changing this altered the height just enough to achieve thorough mixing within the tub. Also important to Pam and John was the ability to feed out the total quantity of each mix. With the two-speed gearbox (540 and 1000rpm), they are able to get down around 100kg, which Pam is happy with. 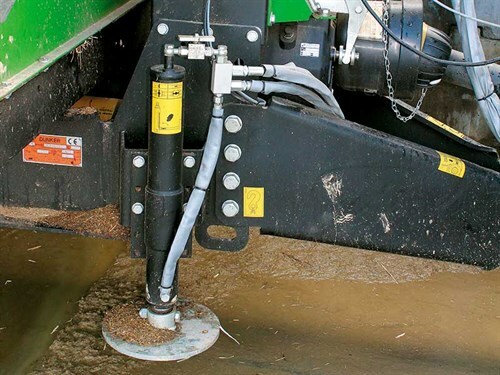 One knife for each auger can be hydraulically added/removed to push feed onto the auger for chopping. There are also sight gauges to check oil level for the augers without climbing underneath. A hydraulic stand for uncoupling the mixer wagon is always a helpful feature on a heavy machine such as this. Although based in Morrinsville, Jon and the Keenan New Zealand team provide servicing throughout the country. Wear and tear on knives, etc. is different with each machine, depending on farm size and feeds used. Mixer wagons with gearboxes and other moving parts will always require more attention than your standard silage wagon, so it pays to budget on at least one service per year (which should be the absolute minimum for any piece of farm machinery). The change in Keenan ownership with Irish science/nutrition company Alltech purchasing Keenan last year has proven successful to date. 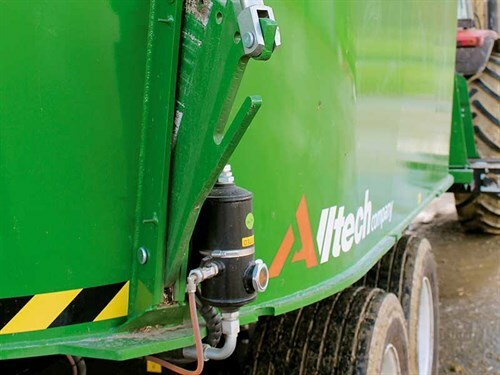 The release of a vertical tub mixer says Alltech and Keenan think smart, and rather than trying to reinvent the wheel, they aligned themselves with Italian business Storti. With similar values – as both are family-owned businesses – Storti knows a thing or two about building mixer wagons, having manufactured them since 1956. Storti’s focus on building machines designed and engineered to last, coupled with Keenan’s similar philosophies and nutritional and technological expertise, has allowed this joint collaboration to create a range of mixer wagons for pretty much any situation. Storti formed a partnership with Keenan in late 2016 adding the option of two- and three-auger vertical tub mixers to the Keenan range with capacity ranging from 18 to 44 cubic metres. As well as the tub mixer, Storti has brought the self-propelled diet option into the Keenan mix. Available in 16 and 20 cubic metre size, this is a completely different machine again. The addition of a vertical feeder to the Keenan range represents exciting times for the Keenan family. 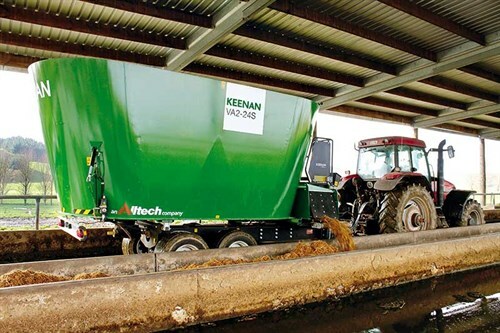 Being able to offer the smallest to the largest mixer wagons in both auger and paddle mixers, as well as nutritional support to get the best out of these machines, makes Keenan a one-stop shop for those looking at mixed ration feeding. Keenan has always had a good reputation for building quality gear and the new collaboration and release of vertical mixers will only enhance this reputation. Loading height is quite high at 3.3m for a conventional 100hp tractor. The longer wheelbase VA2-24L is 350mm lower but 800mm longer.